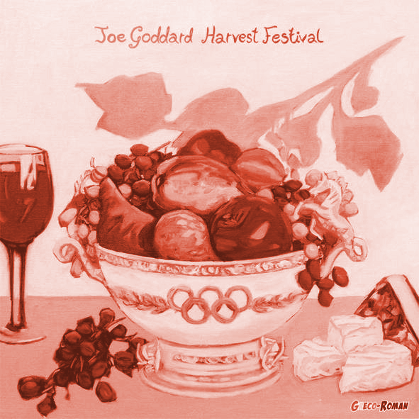 Hot Chip fans rejoice: Our favorite fidgety, funky outsider U.K. pop group is dropping a new album in 2010 (download the unofficial lead single, "Take It In" below), and, to tide us over during the wait, we've got co-frontman Joe Goddard's mostly-instrumental debut solo LP, Harvest Festival (grab the full album over at Traxsource). The 12-track record is, by no means, an exemplary work in the trope of Hot Chip's output, but it's a sturdy one that, at best, holds up well on its own, and, at worst, illustrates an extension and maturation of the H.C. sound the world has come to love. Harvest is, to me, like the merging of a younger Boards Of Canada, glitchy techno, and soothing pop ditties; it's a little scattered and helter-skelter, but bouncy and light-hearted throughout. "Apple Bobbing," a calming yet swirling and energetic jam is the clear standout cut, but no songs are let-downs. "Lemon and Lime (Home Time)" is a bass-heavy pop ballad of Hot Chip proportions as well as an example of Goddard's voice at its best (at times, he sounds like your warm, patient grandfather telling one of his countless tales)―if any track gets made into a video, this would be the one!